Either the insurer or the claimant in a workers’ compensation claim can begin the dispute resolution process. As a claimant, you can start the process by filing a Form 110. Once this form is submitted, a conciliation session will be scheduled. The claimant, the insurer, and their attorneys attend this session, which is facilitated by a conciliator. The purpose of conciliation is to try to reach an informal resolution of the case. However, in many cases, the parties cannot come to an agreement over the case. The next stage is a conference with an administrative law judge (ALJ) or workers' compensation judge. At Pulgini & Norton, our workers’ compensation lawyers can assist injured employees in Boston and the surrounding communities who find themselves in this position. The second stage of dispute resolution in the workers' compensation system is the conference, which is scheduled by the DIA's Central Scheduling Unit. It is informal, but an administrative law judge presides over it. Usually the same administrative judge keeps the case through later proceedings, such as the hearing. What happens in the conference is critical to your case, even though it is informal. At this stage, a claimant needs to be able to establish that he or she is eligible for any benefits being claimed. The conference frames the issues that the parties dispute in connection with the claim, and it is a very important opportunity for a claimant to make a good first impression on the judge and frame the issues in his or her favor. In most cases, the same judge who presides over the conference also presides over the formal "hearing" stage and will handle the case if it comes back from the reviewing board or appellate court. At the conference, the insurer and you can informally make presentations to the administrative judge about the job-related injury and the benefits to which you may be entitled. These presentations are not governed by the rules of evidence. The judge receives any medical documentation and proof of income. Witnesses can provide affidavits or statements on your behalf or the insurer's behalf. However, no witnesses give live, sworn testimony. You would need to show your injury or illness was work-related, the work-related injury or illness caused you to become disabled, and any disputed medical bills were incurred out of necessity. Occasionally, a voluntary agreement may be reached, but in most cases the judge issues a temporary conference order. In the temporary conference order, the judge asks the workers' compensation insurer to pay a certain amount of benefits or tells the insurer it does not need to pay benefits. After the administrative judge issues the conference order, you or the insurer may appeal on an Appeal of a Conference Proceeding (Form 121) within 14 days. The appeal costs $650, although in some cases the fee may be waived by showing financial hardship. The next step is a formal hearing before the same administrative law judge. It is important to strike the right tone and establish your credibility from the start of your workers' compensation case. A conference with an ALJ is a crucial step, and it is important to consult an experienced workplace accident attorney in the Boston area. 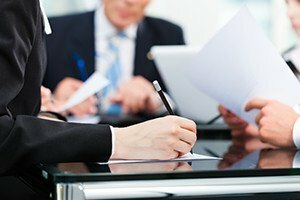 At Pulgini & Norton, we can help make sure your case is presented to the administrative law judge in a compelling manner. We also represent individuals in Brookline, Waltham, Andover, and other cities in Massachusetts. Call us at 781-843-2200 or contact us via our online form for a free consultation.